Summary: The Church of the Transfiguration is placed in the centre of the compound. 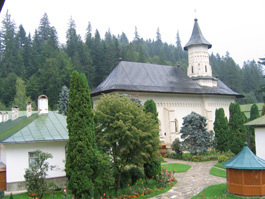 It was modelled on the church of the Probota Monastery, but with increased dimensions, so that it was the biggest church in Moldavia until the end of the 18th century. 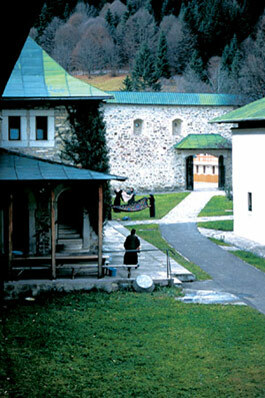 The Slatina Monastery seen from the southwest. The church nestles between three hills, about 30 km northwest of Falticeni, in the middle of peaceful countryside. 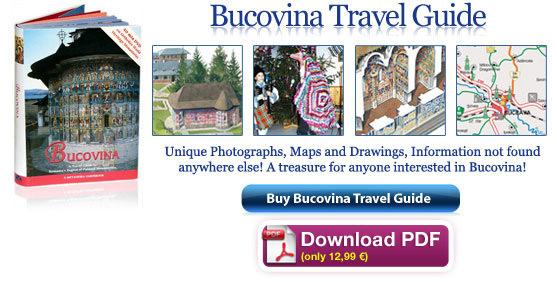 The chronicler Eftimie writes that in 1554 prince Alexandru Lăpuşneanu “left Suceava for River Suha, in order to investigate and find a place for the monastery. 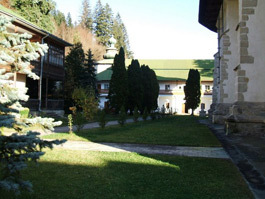 (…) The Prince saw the place and was very glad and liked it very much and paid homage to God and gave name to the Monastery of Slatina and appointed the first superior, Iacob, also named Molodeţ”. 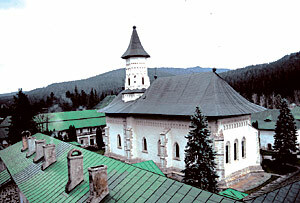 The Church of the Transfiguration follows the shape of the earlier Moldavian churches, but is simpler: there are no round apses on the north and south façades. 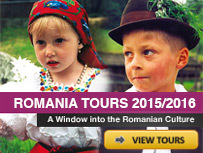 Few years after the death of Alexandru Lăpuşneanu, the monastery was again pillaged. 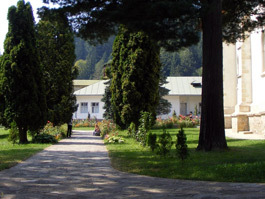 The church was again repaired, and the superior Nil placed on behalf of Lăpuşneanu a posthumous commemorative inscription above the entrance of the edifice. 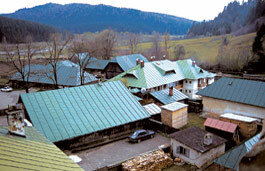 As models were used the inscriptions of Probota and Putna Monasteries. The inscription says: “With the Father’s will, the Son’s help and the Holy Spirit’s blessing, I, the slave of God, the deceased believer Prince Alexandru with my wife Princess Ruxandra and children given by God: Bogdan, Ioan, Petru and Constantin, started building this edifice dedicated to the Transfiguration of Our Lord, in the year 7069 (1561)”. The refectory and nuns’ cells in the south wall building. 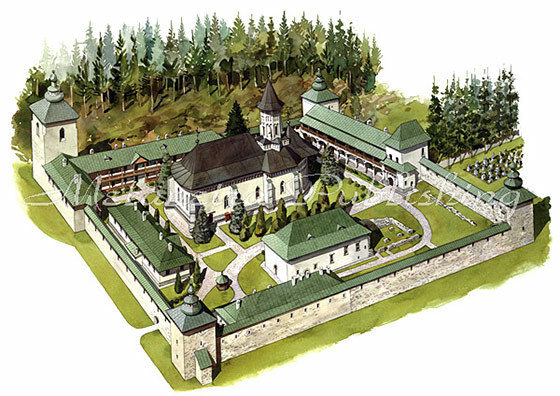 The monastic compound is irregular, for the line of the east wall is broken by the gate tower, which was built in 1834. Above its vaulted entranceway is a chapel dedicated to Sts. Nicholas and Spiridon painted in Byzantine style. A catwalk on the south wall tells that the high walls were built to defend the monastery from marauders. In each corner of the compound is a massive tower, the northwest tower being much higher than the others. This is the bell tower, where the two big bells cast in 1830 are kept. 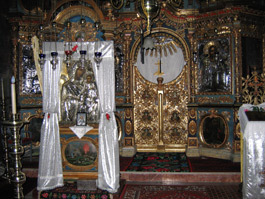 The iconostasis forms a very unusual three-sided apse-like wall between the naos and the chancel. Originally the church had five rooms, chancel, naos, burial chamber, pronaos and exonarthex, but the burial chamber was demolished in 1828. 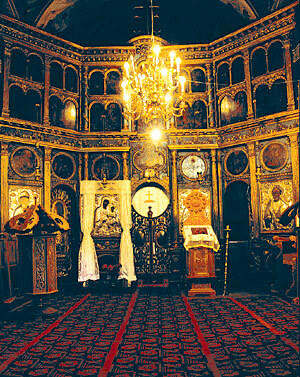 Unlike Probota, the apses of the church are not visible outside, but they are carved out of the width of the wall. There are nine buttresses, two on the west façade, three on the north and south façades and one on the east apse, but they seem more decorative than functional. The façades are rendered and limewashed, decorated with niches. Embedded in the south façade of the church is the tomb of the superior Nil, who placed the commemorative inscription on the church wall. To the west, on the plinth of the exonarthex, there is a tombstone of an unknown monk. The entrance to the church is through two doors, one on the south façade and the other one on the north one. 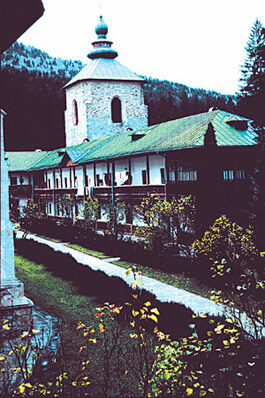 Nunnery buildings with their wooden balconies and the tall bell tower. Nuns give an airing to carpets in the yard. 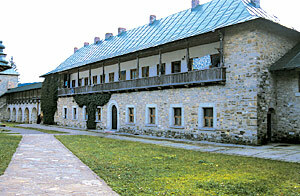 The necessary warehouses, sheds and stables are placed outside the monastic walls. 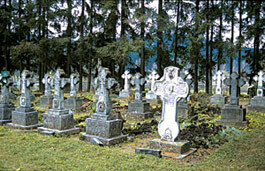 The cemetery is outside the monastic compound, near the long alley of pines.